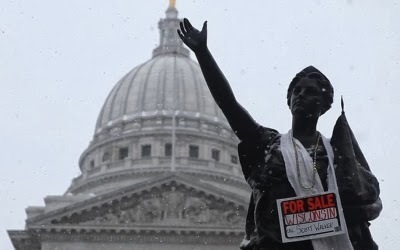 Carl Deal and Tia Lessin's Citizen Koch examines the ugly relationship between money and politics. Well, it's ugly for the little guy, but it's a beautiful thing for the 1% who throw tens of millions of dollars into Super PACs and astroturf groups like the Tea Party. I'm talking about people like David Koch, Charles Koch, Sheldon Adelson, and Harold Simmons. By the end of the documentary, my big take away was this: we're f**ked already as a country, but if we don't do anything to change the current plutocracy, we're royally f**ked. Deal and Lessin's primary focus is the political landscape following the Citizens United ruling in which the Supreme Court basically gave corporations unlimited ability to make political contributions. Politics and money have always been a given, but the current chains of influence and power grabs are terrifying. 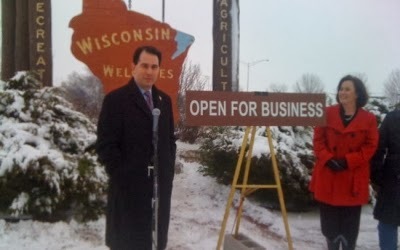 In the case of Wisconsin governor (and unrepentant union buster) Scott Walker, we watch him kowtow to his money people, most of them from out of state; he does what the money people want, even if it's not best for his constituents. As for the Tea Party, the film shows some candid looks at these low-information voters dressed in britches and tricornes and the flag. It's the money people who ultimately benefit from this buffoonish masquerade. They're playing these silly rubes like Mongo from Blazing Saddles. This is all obvious stuff for anyone in the Mother Jones, Nation, Democracy Now, NPR, New Yorker, or MSNBC crowd, and Citizen Koch could have simply been a liberal polemic. Yet Deal and Lessin make a smart decision in how to explore these issues of money and political influence. The people they follow are Republicans and conservatives who feel like their party has left them behind. 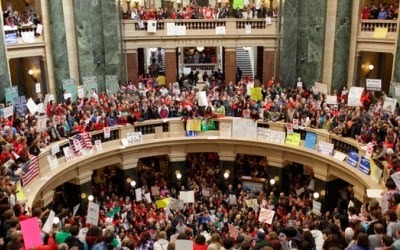 We meet proud conservatives in Wisconsin who are also proud union members, and they don't take kindly to their bargaining rights being taken away. There's also Buddy Roemer, a former Louisiana congressman and governor trying to run in the Republican primary in 2012. He's being kept out because he doesn't have the money and isn't running on a platform that the money people appreciate. There are times that Citizen Koch can be a real source of despair. The money people have so much power to influence the the way people think about issues. With a TV spot, they can get a bunch of angry mooks to oppose something that's actually in their best interest. What do the informed and with-it people have to combat this level of influence? A vote a piece. And really, it may not be enough. I'm beginning to think that George Carlin was right all along: the only choice we have in this country is paper or plastic, and all the real decisions aren't made by the politicians or the people but the owners of society. Just how influential are the owners? Well, it's because of David Koch that Citizen Koch will not air on PBS. Koch is a major donor to public television and he had objections to the documentary's content, so PBS killed it even though they had had plans to air it. (Koch's also a major donor to medical reseach and a noted patron of the arts throughout New York City. His name is on a theater in Lincoln Center. The owners lead interesting lives.) Yeah, PBS kowtowed to the owners of society and discarded the filmmakers and the film in the process. Even the people who should be courageous in face of influence are, in the end, willing to compromise their ideals and the ideals of their organization for just a little taste of cash. Are you depressed yet? That feeling is why we need to do something before our country gets even more f**ked than it is already. Go see Citizen Koch when it plays in your area and when it opens some time in 2014. Not only is it a well-made documentary and an even-handed one, but it's something that the owners of society don't want you to see. So, let's stick to to those no-good rat bastards any way we can. Stay informed, demand transparency of political contributions, get serious about publicly funded elections. It may be a losing battle, but this is a battle worth fighting.